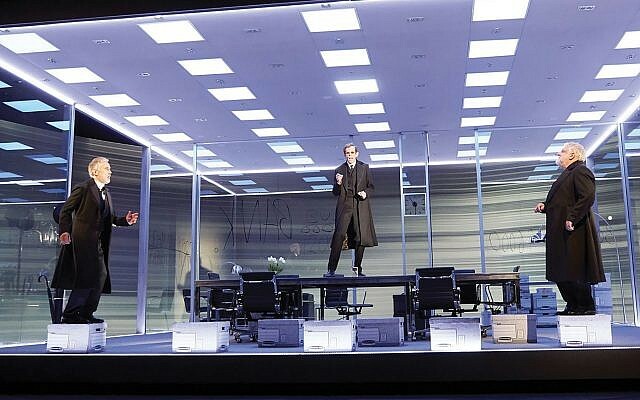 Stefano Massini’s hit London production of “The Lehman Trilogy,” directed by Sam Mendes, explores how a general store opened by Bavarian Jewish immigrants in 1840s Alabama grew to become one of the world’s leading investment banks. 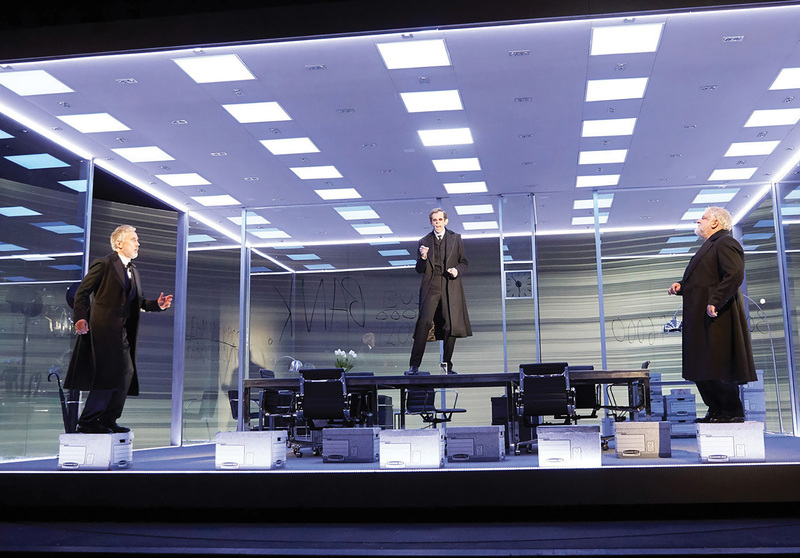 Starring three acclaimed British actors — Simon Russell Beale, Ben Miles and Adam Godley — the play tracks the ever-riskier tightrope act of three generations of the ultra-wealthy Jewish family as it moves from trading coffee and cotton to evermore complex financial vehicles. The Lehmans’ collapse in 2008 helped take down the U.S. economy. The Times hailed the play as “magnificent.” — Through Saturday, April 20, Park Avenue Armory, 643 Park Ave., (212) 933-5812, armoryonpark.org. Featuring Yiddish and English poems set to music, composer Alex Weiser’s searching work emerges from his encounters with Jewish music and Yiddish literary culture as director of public programs at YIVO. 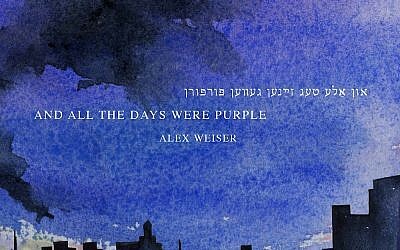 The “All the Days Were Purple” album weaves together poetry by Anna Margolin, Edward Hirsch, Rachel Korn, Abraham Sutzkever and others. The evening features performances by vocalist Eliza Bagg, pianist Lee Dionne and violinist Maya Bennardo, among others. Also on tap is the premiere of new Weiser arrangements of Yiddish and Hebrew songs from the YIVO Archives by composers Joel Engel, Moses Milner, Lazare Saminsky and Alexander Veprik. The CD will be available for pre-release purchase after the concert at a special reception. — Tuesday, April 9, 7 p.m., YIVO Institute, 15 W. 16th St., (212) 246-6080, yivo.org. Talk about a prescient lyric given our immigration crisis. Oscar Hammerstein writes in “South Pacific,” from 1949, “You’ve got to be taught to be afraid / Of people whose eyes are oddly made, / And people whose skin is a diff’rent shade / You’ve got to be carefully taught.” Hammerstein’s journey to become one of Broadway’s greatest lyricist is explored in this musical. It showcases 30 of his greatest songs from shows like “The Sound of Music,” “Show Boat” and “Oklahoma!” With contributions from the lyricist’s grandson, Will Hammerstein, and 3D holographic technology. — Opens Thursday, April 4, Theatre Row, 410 W. 42nd St., (212) 239-6200, SincerelyOscar.com. “Fiddler” in Yiddish, the unexpected runaway hit that both delighted and choked up audiences at the Museum of Jewish History, is now Off-Broadway. Directed by the acclaimed Joel Grey, a rich Yiddish translation by the late Shraga Friedman adds new depth to the iconic musical. With English and Russian supertitles. — Stage 42, 422 W. 42nd St., (212) 239-6200, telecharge.com. Playwright Sarah Gancher and Museum of Jewish Heritage Prins Fellow Eszter Susán have collaborated to create “7th,” a theater project inspired by Budapest’s 7th District, containing the historic Jewish quarter of Pest. The discussion with Susán will be followed a reading of “Five Mothers,” a one-act play presenting the stories of five generations of women in a Hungarian Jewish family. Directed by Danya Taymor. — Tuesday, April 9, 7 p.m., Museum of Jewish Heritage, 36 Battery Place, (646) 437-4202, mjhnyc.org. 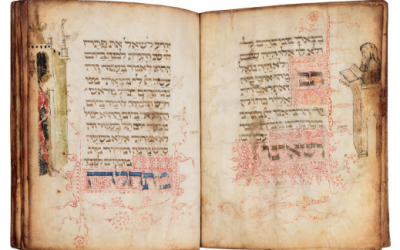 City Winery’s annual Downtown Seder features noted performers expounding on various sections of the Passover Haggadah, which have been specially developed for this night. This year’s lineup includes comedian Judy Gold, singer-songwriter David Broza, singer/actress Sarah Dash, the Resistance Revival Chorus, film producer Michael Skolnik, comedian Ari Shaffir and more. — Monday, April 8, 3 p.m., City Winery, 155 Varick St., (212) 608-0555, citywinery.com. Based on British playwright’s David Hare’s work of the same name, Cam Christiansen’s film brings animation to the story of Israel’s security barrier, which snakes 435 miles and divides Israelis from Palestinians in an attempt to reduce terrorism. Critics see it as helping to reinforce Israeli policy in the West Bank. Presented in association with The Other Israel Film Festival. — Through Tuesday, April 9, Film Forum, 209 W. Houston St., filmforum.org. In 1935, Jewish painter, writer, doctor and anti-Fascist leader Carlo Levi, who died in 1975 (played by Gian Maria Volontè), is exiled from Turin to Lucania, a remote region in southern Italy — a place so abject even Christ has forsaken it. In this most desolate of landscapes, he finds a town with one car and only one porcelain toilet, where magic spells, curative coins and evil spirits exist side by side with Christianity. This is the U.S. premiere of the complete, uncut version of Francesco Rosi’s 1979 film. — Wednesday, April 3, Film Forum, 209 W. Houston St., (212) 727-8110, filmforum.org. The disbanded crew from Cornelia Street Café, which shut down this January, reunites for a series of pop-up performances in a new location in Brooklyn. A one-time resurrection of Cornelia’s “Israeli Jazz Spotlight” series features the Israeli-American guitarist Yoav Eshed and his trio, followed by jazz pianist Guy Moskovich. — Sunday, April 7, 8 p.m. Yoav Eshed Trio, 9:30 p.m. Guy Moskovich, Brooklyn Commons/Commons Café, 388 Atlantic Ave., corneliastreetcafe.com. Conducted by Cantor Moishe Bear, with Yiddish and English readings, this evening features music by Yiddish singer/songwriter Miryem-Khaye Seigel, pianist Alex Rubenstein and other special guests, alongside a glatt kosher Pesach meal. — Thursday, April 11, 6:15 p.m., Sutton Place Synagogue, 225 E. 51st St., (212) 593-3300, spsnyc.org. Bill Magaliff, a New York native who produces community-building artistic events through a Jewish lens, performs highlights from the Hebrew songbook. Part of the “Hagigah Ivrit” festival in NYC. — Sunday, April 7, 5 p.m. doors, 6 p.m. start, City Winery, 155 Varick St., (212) 608-0555, citywinery.com. Rodeph Sholom Cantors Rebecca Garfein and Shayna De Lowe host fellow chazans from around the country in a musical revue inspired by stories of famous Jews in pop culture. Based on the best-selling book by Abigail Pogrebin, this musical adaptation celebrates the Jewish identity of America’s most notable public figures, including Fran Drescher, Ruth Bader Ginsburg, the late Leonard Nimoy and more. — Monday, April 8, 7 p.m., Congregation Rodeph Sholom, 7 W. 83rd St., (212) 362-8800, rodephsholom.org/events/stars-of-david. With his guttural voice and dark lyrics, fluctuating between poetry and rock, Eran Tzur, a staple of Israeli rock since the early ’80s, has often been referred to as Israel’s Leonard Cohen. The performance is in Hebrew. — Thursday, April 11, 8 p.m., City Winery, 155 Varick St., (212) 608-0555, citywinery.com. Big-toned Israeli-American bassist Omer Avital is a poet of the bass, widely hailed by international musicians, critics and fans as one of the most innovative and exceptional musicians of his generation. “He can be fleet and jazz-melodic in the style of Oscar Pettiford, then buzz around the tonic like a devotional singer,” The Times’ Ben Ratliff writes about Avital, one of the first Israelis to make a mark on the jazz scene here. — Monday, April 8, 7:30 – 10 p.m., Smalls Jazz Club, 183 W. 10th St., (646) 476-4346, smallslive.com. Israeli-American saxophonist-arranger Vilner leads a 16-piece band that threads boogie-woogie, swing and vintage ballroom jazz. About Jazz NY hailed him as “an exciting new sound in the finest tradition of contemporary big band music.” — Sunday, April 14, 3-6 p.m., Museum at Eldridge Street, 12 Eldridge St., (212) 219-0302, eldridgestreet.org. Americans who remember World War II reminisce about how it brought the country together. The less popular truth behind this warm nostalgia: until the attack on Pearl Harbor, America was deeply, dangerously divided. Author Bradley W. Hart discusses the homegrown antagonists who sought to protect and promote Hitler. A book signing follows. — Friday, April 5, noon, 92nd Street Y, 1395 Lexington Ave., 92y.org. A traditional form of Jewish folk art, paper cutting has often been used over the ages to references to Jewish lore, symbols and scripture. “Releasing Words: The Cut Paper Art of Deborah Ugoretz” is a retrospective show of visual-artist Deborah Ugoretz, from traditional ketubot (elaborately decorated marriage contracts) and pieces inspired by biblical texts and prayer to more recent work, which consider Jewish tradition as a jumping board for contemporary concepts. — Through Friday, April 12, Museum at Eldridge Street, 12 Eldridge St., (212) 219-0302, eldridgestreet.org.